Women Howling at the Moon is a vibrant community of women who are passionate about creating a just and sustainable world, and the conversations and actions to have that happen. We meet on the night of the full moon (or close to) to dine together. We share our visions and passions. We share stories of challenges and courage, we laugh lots, we focus on a particular topic that would make a difference in our lives - and oh yes, we howl (optional)! We leave the evenings uplifted, inspired by ourselves and others, with new friends and with renewed hope and energy for our lives and the world. Join us! The world needs your voice and what you have to offer, now more than ever before. 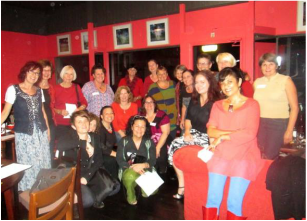 Our next event in Brisbane is on Wednesday 21 February. Welcome to this network of strong, wholehearted, outside-the-box professional and activist women who are passionate about a just and sustainable world. ​ ​★ Hear & ﻿﻿share tales of ﻿﻿courage ★ Connect with your passion ★ Be the change you want to see. Video comments above - Tania Budd, Creative Arts Therapist. ​Click for more video comments. This community of inspiring women shares a genuine desire to live life to the full, to make conscious choices about striving towards your vision, and to be present with each other at a deep level through the struggles and the successes. This is my tribe. - Kathryn Walton, Mental Health Social Worker. Above: Women speak about Howling evenings. Evening events are generally held from 5.45 pm for 6 pm until 10 pm. Chris Henderson (Chris Henderson Success Coaching) is a Courage catalyst and Personal coach to professional women. She founded Women Howling at the Moon ​in March 2013. Chris is now National President of the Women's International League for Peace and Freedom (WILPF) Australia.